This project was created on 10/16/2015 and last updated 2 months ago. I got tired of using jumpers to break out the ICSP pins for programming and the TX/RX pins for debugging. It took up precious space on my breadboard and made the whole thing messier. So I made a little breakout board that conveniently fits right over my Atmega*8 (168, 328) chips. When I&apos;m done programming, all that&apos;s left is the main circuit with none of the extra crap. The initial prototype just broke out the ICSP header block. The new version has headers for an FTDI cable, indicator LEDs and a reset button! You can create a homemade version with any perf board and a few headers (see steps below) or you can make the advanced version with the PCB and gerber files from my upverter page. Or you can order the board directly from my project files on OSH Park. I&apos;ve added two new LEDs for MOSI and MIS (be sure to read the IMPORTANT NOTE at the end of this post). These serve a dual purpose: First, they&apos;ll flash during programming, so you know the programmer is working. Then, you can control them directly with PB3 and PB4. This is good if you need quick debugging LEDs. At the smaller end, there was some basic housekeeping. I updated the reset button to a new lower profile tactile. The layout is more compact and I updated the silkscreen on the programming header, so that it&apos;s obvious which way to install it. Since ordering the boards I have also added some rounded corners for some final polish. The symbol on the bottom of the power LED and the MOSI/MISO LEDs is opposite (weird, right?). Be sure to check the datasheet. On the board the dots for the LEDs represent the cathode. I finally received the PCBs from OSH Park and they worked great right out of the gate. I tried round machine pins, instead of the usual break away headers, and found they felt much better when plugging the backpack in. Pictures and more info after the break. This is instructions for building just the ICSP version of the backpack. Adding the FTDI section is very similar. Cut a perf board down to at least 6x13. You want it 2 holes wider than the atmega footprint, so the male breakaway header "legs" will straddle the chip. Figure out how you&apos;re going to wire up your 2x3 header block to the legs. Basically just connect everything together. MISO to MISO, VCC to VCC, etc. Nice. That&apos;s a good idea. was just working on the same problem, myself. This is a good implementation. 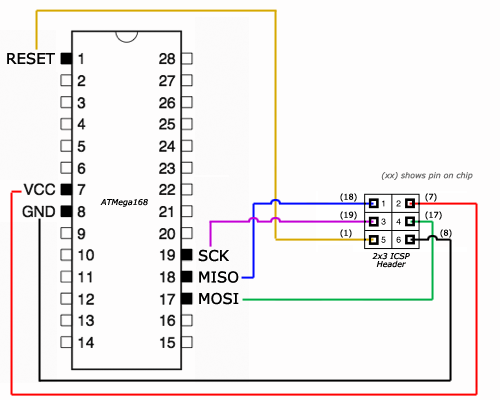 You are about to report the project "Atmega*8 Breadboard Backpack", please tell us the reason.